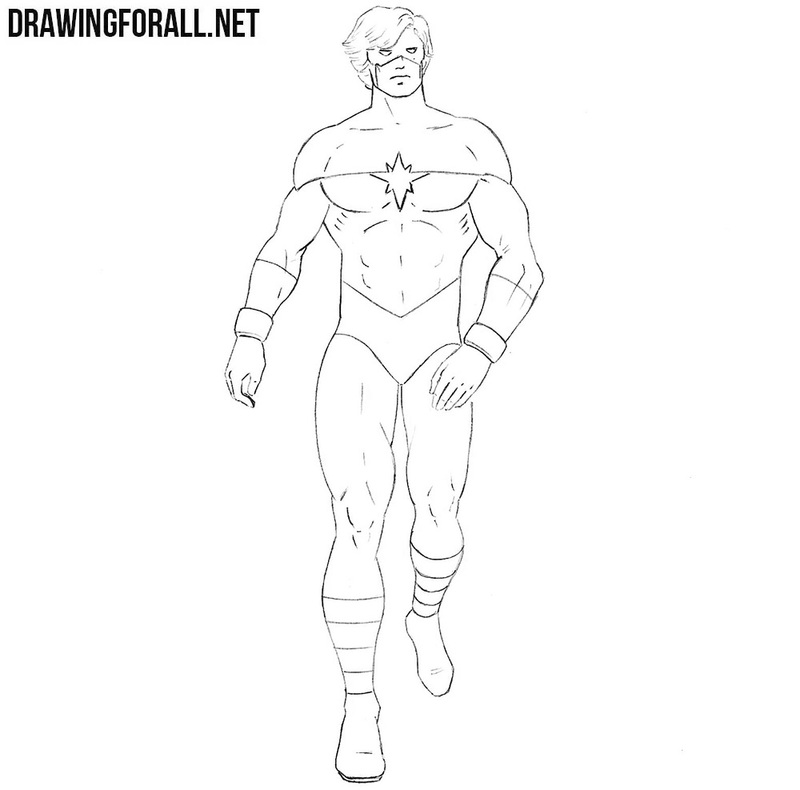 In one of the previous drawing lessons we showed you how to draw Captain Marvel. But as you know, this name is worn not by one person, but a number of different characters. Today we want to draw the very first character who wore this name. So, let’s start the lesson about how to draw Mar-Vell. So, let’s start with the skeleton of our character. First of all sketch out the head in the form of an oval. Next, outline the spine, on which we sketch the chest and pelvis. 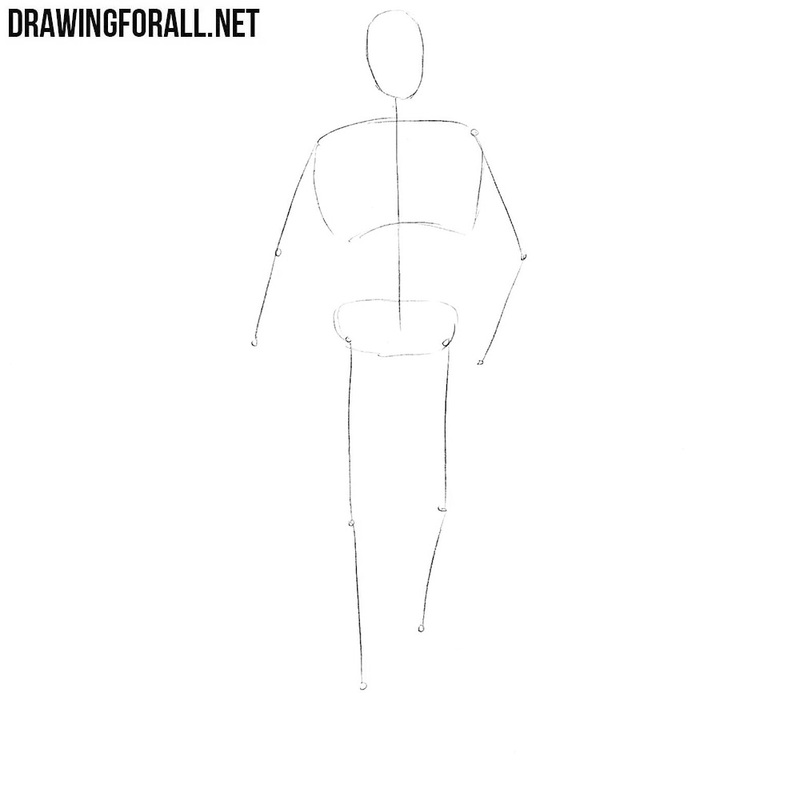 Using simple lines draw arms and legs. Recall that all lines should be done with very light lines. Next, outline intersecting lines on the face, with the help of which in the future we will draw the details of the face. Next, we mark the neck in the form of cylinder and the outlines of the torso. Note that the torso should be wide at the shoulders and taper at the waist. Next, using simple geometric lines sketch out the arms and legs. In this step we will add the most basic details. On the head sketch out the eyes, nose and mouth with the help of intersecting lines from the previous step. Next, sketch the outlines of the costume and move to the next step. Starting with this step we will use clear and dark lines. Draw the eyes, nose and mouth as shown in our example. 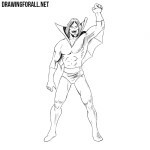 Carefully draw the hair and mask of our superhero. Next, carefully draw out the outlines of the neck and torso. By clear and dark lines neatly draw wide pectoral muscles and abdominal muscles. Next remove all unnecessary guidelines from the torso and draw the details of the costume. Now we work with the lower body of Mar-Vell. 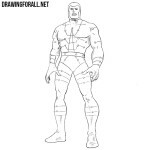 Using dark lines, carefully draw out the outlines of all the muscles of the legs as shown in our example. Remove all remaining guidelines from the Mar-Vell drawing to make it more cleaner. Now will be quite a difficult step. Here we will need to paint some parts of the costume as shown in our example and add shadows. To make shadows and paint over the costume elements, use black and contrast lines. In order to draw lighter shadows, use a dense hatching. This lesson was quite difficult, but now you have learned how to draw Mar-Vell. Subscribe to us on social networks in order not to miss a single new drawing lesson.